The ongoing drought in the U.S. west and mountain region is leading to the surprise reappearance of historical artifacts, including entire towns and villages emerging from the sand and muck left behind by drying reservoirs. "As water levels recede," the Wall Street Journal quips, "the past has emerged." More specifically, this means that "long-submerged historic artifacts and natural features are [being] exposed by receding lake levels," the newspaper adds. Even the outer periphery of a drowned town known—somewhat ironically—as Mormon Island has re-appeared on the edge of California's Folsom Lake. Originally built and settled as a gold rush town in the mid-1800s, Mormon Island is now an unlikely tourist attraction for locals, the WSJ reports: "On an unseasonably warm winter day recently, throngs of visitors descended on the cracked mud flats of the reservoir to inspect hand-forged nails, rusted hinges and other vestiges of frontier life that were inundated when the lake was created in 1955." For images, click through to the Wall Street Journal. Of course, the story of Mormon Island is in addition to a long list of other flooded towns and villages found across the west that are coming into a ghostly afterlife from the silt and gravel; they have even been described as "resurrected." The WSJ alone mentions Bluffton, Texas, where "the remains of homesteads, a store and cotton gin that had been mostly under water since the reservoir was created in 1937" have all come back on-stage for an historical encore, and Lake Powell in Utah, where a decade of lowering water levels "has uncovered artifacts including Native American ruins known as Fort Moki by 19th century pioneers." But this is by no means a phenomenon limited to the United States; medieval churches have been revealed by drought in Spain and a church also reappeared in Venezuela after reservoir levels dropped. And there are, as we've seen here on Gizmodo, flooded villages on the U.S./Canada border that, who knows, might someday stand on dry ground again. More importantly, though, curious visitors and amateur collectors alike are beginning to pick the old sites dry, rambling through the ruins of these dead towns revealed by drought, carrying metal detectors and looking for worthy artifacts. In the process, they are removing old objects—even whole pieces of architecture—before local authorities have the time and resources to catalog and protect what is re-emerging there. 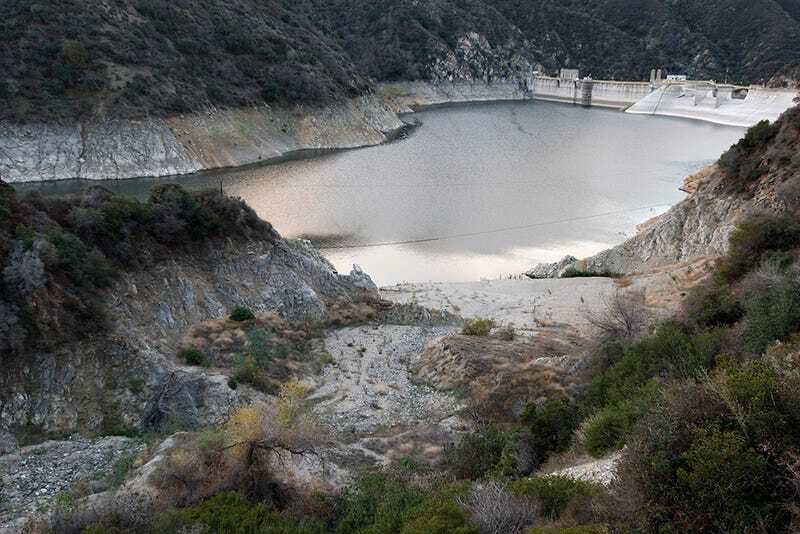 This surreal and unexpected opportunity to explore what was lost—in some cases nearly 100 years ago—mummified by water and preserved beneath the rising waves of western reservoirs, might thus simply go to waste.